A hormone is a secreted chemical messenger that enables communication between cells and tissues throughout the body. Hormones are released into the bloodstream through which they travel to target sites. 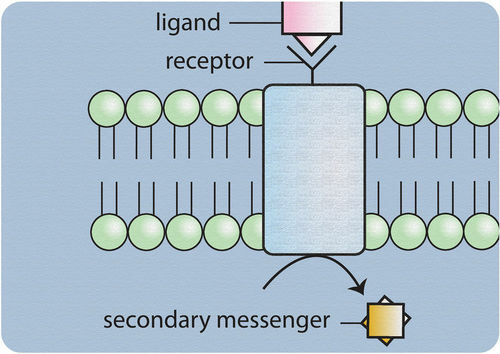 The target cell has receptors specific to a given hormone and will be activated by either a lipid-soluble (permeable to plasma membrane) or water-soluble hormone (binds to a cell-surface receptor). Lipid-soluble hormones diffuse through the plasma membrane to enter the target cell and bind to a receptor protein. Water-soluble hormones bind to a receptor protein on the plasma membrane of the cell. Receptor stimulation results in a change in cell activity, which may send feedback to the original hormone-producing cell. Water-soluble hormone: A lipophobic hormone that binds to a receptor on, or within, the plasma membrane, to initiate an intracellular signaling cascade. hormone: A molecule released by a cell or a gland in one part of the body that sends out messages affecting cells in other parts of the organism. Lipid-soluble hormone: A lipophilic hormone that passes through the plasma membrane of a cell, binds to an intracellular receptor, and changes gene expression. A hormone is a chemical messenger that enables communication between cells. Hormones are secreted by the glands of the endocrine system and they serve to maintain homeostasis and to regulate numerous other systems and processes, including reproduction and development. The glands of the endocrine system secrete hormones directly into the extracellular environment. The hormones then diffuse to the bloodstream via capillaries and are transported to the target cells through the circulatory system. This allows hormones to affect tissues and organs far from the site of production or to apply systemic effects to the whole body. Hormone-producing cells are typically specialized and reside within a particular endocrine gland, such as thryocytes in the thyroid gland. Hormones exit their cell of origin through the process of exocytosis or by other means of membrane transport. Cellular recipients of a particular hormonal signal may be one of several cell types that reside within a number of different tissues. This is so in the case of insulin, which triggers a diverse range of systemic physiological effects. Different tissue types may also respond differently to the same hormonal signal. As a result, hormonal signaling is elaborate and hard to dissect. Hormones activate target cells by diffusing through the plasma membrane of the target cells (lipid-soluble hormones) to bind a receptor protein within the cytoplasm of the cell, or by binding a specific receptor protein in the cell membrane of the target cell (water-soluble proteins). 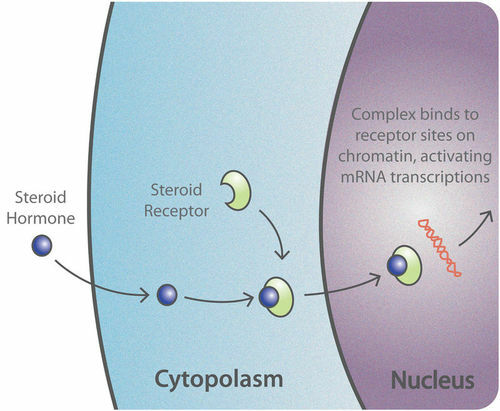 In both cases, the hormone complex will activate a chain of molecular events within the cell that will result in the activation of gene expression in the nucleus. The reaction of the target cells may then be recognized by the original hormone-producing cells, leading to a down-regulation in hormone production. This is an example of a homeostatic negative feedback loop. Lipid-soluble hormone receptor activation: Nuclear hormone receptors are activated by a lipid-soluble hormone such as estrogen, binding to them inside the cell. Lipid-soluble hormones can cross the plasma membrane. Biosynthesis of a particular hormone in a particular tissue. Storage and secretion of the hormone. Transport of the hormone to the target cells, tissues, or organs. Recognition of the hormone by an associated cell membrane or an intracellular receptor protein. Relay and amplification of the received hormonal signal via a signal transduction process. Potential feedback to a hormone-producing cell. Water-soluble hormone receptor activation: Water-soluble hormones, such as epinephrine, bind to a cell-surface localized receptor, initiating a signaling cascade using intracellular second messengers. Peptide: Hormones that are modified amino acids or short (peptide) or long (protein) chains of amino acids. Additionally, they can contain carbohydrate moieties. Lipid: Steroid hormones that contain lipids synthesized from cholesterol and eicosanoids that contain lipids synthesized from the fatty acid chains of phospholipids found in the plasma membrane.